Tucked away from traffic and pollution of the city, into a quite neighborhood at Kondhwe Dhawade “HARITARA” is the perfect blend of comfort and convenience. It’s easy access to the Mumbai – Bangalore highway, Satara Road and Sinhagad Road, As well as close proximity to recreational hubs, schools and educational institutions Makes it the most convenient location. A locale of remarkable beauty with breathtaking views, The homes come with generously sized rooms with abundant natural light and spacious living. Boasting an array of extra including club house, amphitheater, children’s play area, jogging track, Piped gas and solar water heating system. 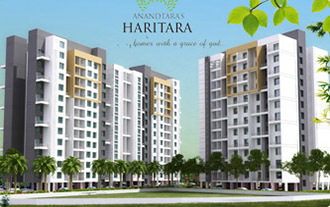 “HARITARA” is sure to keep you bright and rejuvenated throughout the day… everyday. 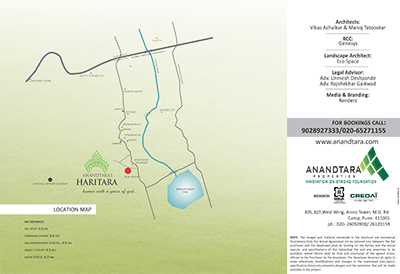 Living at HARITARA is an exciting experience. A well spread layout of the project with ample space between the buildings and the spectacular views of the lawns and gardens, every step you take here is Going to be a pleasure. Open skies, crisp sunshine, birds chirping and the little ones, happily savored the elderly, this really is a place for every one to relax and rejoice. Spend your Sundays on the well manicured lawns getting a golden suntan while reading books or simply Sharing the tender moments to your hearts content… it’s a real treat for your soul!